Formerly listed here as T. truncata. See notes below. Bruce Dunstan, 09/12. Originally as T. truncata. Bruce Dunstan. Sept 2012... "Collected seed of this along the Rio Nangaritza near Cordillera del Condor in 2009. The plants there are way smaller than others I have seen at altitude in Peru. 3 years from seed to flowering and looking at the plant I am not expecting pups." Chris Larson..."The rosette looks a lot more open than the clone I have. Your habitat photos seem to support the idea that this one may not send a pup." Peter Tristram 07/13. Originally as T. truncata. Peter Tristram 07/13..."It’s nearly a year and a truncata from Jeff Kent is blooming, looking just like Bruce’s and about the same size. The good news is that they do pup and are fairly fast growing, as well as having an attractive spike with yellow flowers. 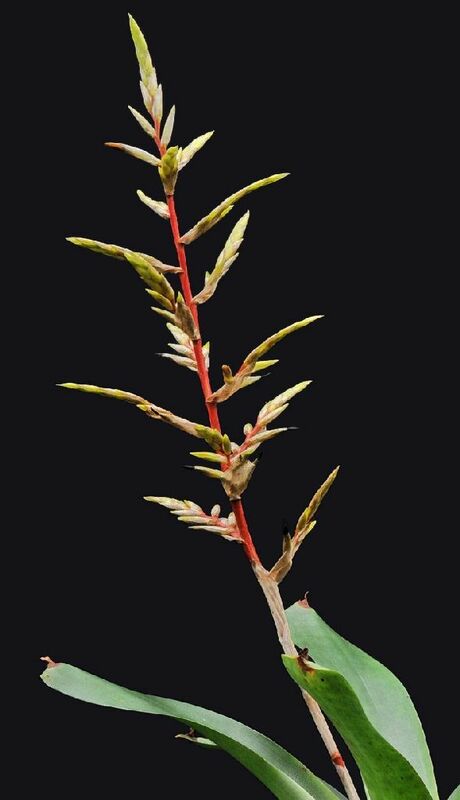 I wonder where it will fit in the new dna chart as this species wasn’t sampled in the Tillandsioideae reclassification but I doubt in Tillandsia." Derek Butcher..."Is there any significance that petals are yellow not white?" 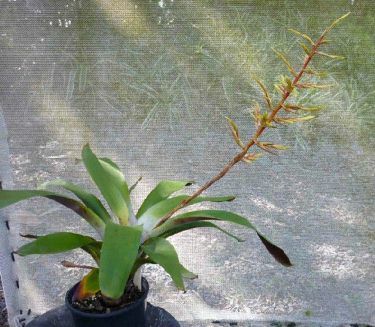 Bruce Dunstan..."José saw this plant when he visited and he thought it was T. asplundii, which hasn't been published yet. We'll have to wait for that to happen, maybe when the first Tillandsioideae book comes out. The T. truncata I saw in Peru were growing between 2-3500m. and seemed to be double or even triple the size of this flowering plant. The plant I collected was down at 700m in Sthn Ecuador alongside the Rio Nangaritza. I know Jeff has been to the same spot collecting so I wonder where his plant was collected?. Anyway, all extra info on a lovely plant that thankfully does pup after flowering. While in Brisbane José only showed nice images of him and Eric collecting in what seemed every direction around Ecuador." 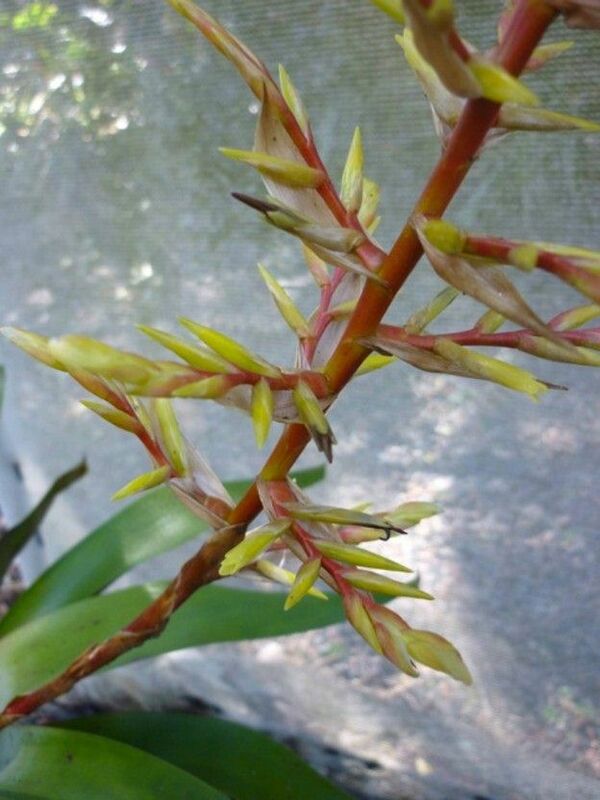 Peter Tristram..."I have been racking my brain about a similar plant since I made the post, just now realising it was at Maurice's and I found it under T. selleana. Then there's T. singularis from Costa Rica/Panama, another candidate a few years back. T. asplundii is in the dvd and looks a very good match without delving too deeply so this might be the new identity. T. selleana is from the West Indes and I doubt Maurice's plant was really that - probably asplundii ! If my memory serves me right Maurice's plant died?? 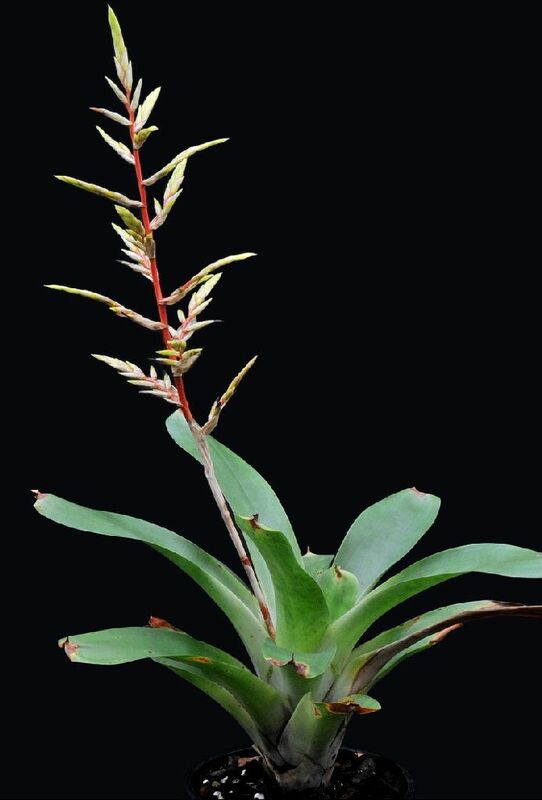 Interestingly T. asplundii is in the dna chart, next to singularis in the new Cipuropsis-Mezobromelia clade (in with the various Vrieseas except the grey-leafed Andean ones) and nowhere near selleana which is next to guatemalensis and leiboldiana firmly rooted in Tillandsia subg. 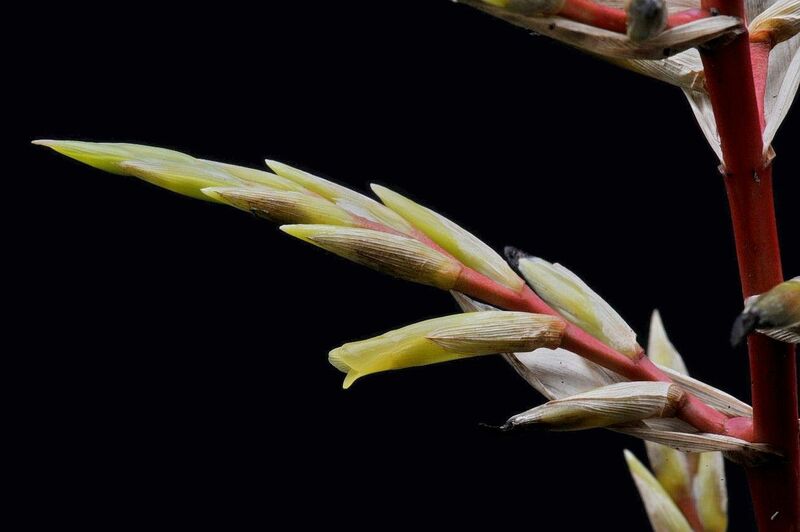 Tillandsia. All very interesting. Those 2 species are still listed in the chart as Tills though. I expect the charts will be published soon for all to see and ponder." Derek Butcher..."Will file your photos under T. asplundii unless you come up with something better. Note that Eric on TAXON has lots of herbarium references but no live stuff!" Peter Tristram..."Derek, Jeff collected it in Nth Peru, Alto Mayo area, so similar climate I’d say to where Bruce collected his seed, just a few hundred km sth."